Why do people love Galway so much? It’s a little bit like Disneyland for adults — if Disneyland was predominantly based around betting and beer. And it’s getting more popular every year. Organisers expect around 150,000 people to attend this week to watch the 52 races worth €1.8 million in prize money. Today! The first of the punters will flock to Ballybrit on Monday afternoon for the first day of a marathon seven-day festival. One thing to remember: double-check the time of the first race before you go. That’s a lot of races – which are the important ones? The two biggest races are thetote.com Galway Plate and the Guinness Galway Hurdle, the feature races on Wednesday and Thursday respectively. Expect to see some familiar names like Rebel Fitz and Rule the World in the line-up for the Plate on Wednesday, while the Tony Martin-trained Quick Jack looks set to go off favourite in the Hurdle. Thursday is traditionally Ladies’ Day which, combined with the Galway Hurdle, means you can expect it to be a busy day on the course. Since 2013, Galway has also run a second Best Dressed competition on the Friday with more prizes for the snazzily attired. If you have a young family, you might prefer the Family Day and Mad Hatters Day on the Sunday when children are admitted for free. Yes, RTÉ will have live coverage from Monday through to Thursday. After that, you’ll have to find yourself access to AttheRaces if you want to watch the last three days of the festival. Any tips on who to back? There’s a very good reason why Dermot Weld is known as the King of Ballybrit. Remarkably, he has been leading trainer at the festival for the last 28 years! In a record-breaking week in 2011, he sent 40 horses to the Galway Races — and 17 of them won! Now that doesn’t mean he will win every race but if you’re stuck for a pick, you could do a lot worse. Will I see anybody famous there? Email “What's the big fuss about the Galway Races? Here's everything you need to know”. 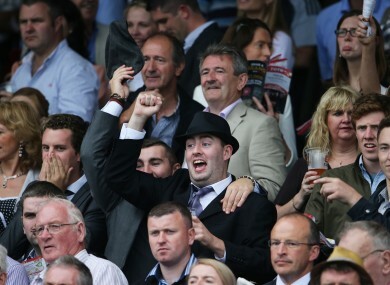 Feedback on “What's the big fuss about the Galway Races? Here's everything you need to know”.